What Mount Vesuvius and Dieting have got in common. Last week I visited Sorrento on Italy’s Amalfi coast. This beautiful area famous for its weather, stunning scenery and picturesque towns is also famous for a disaster that struck the region 2000 years ago, the eruption of Mount Vesuvius. Along with countless other tourists we made our way to Pompeii and Herculaneum to explore the city streets uncovered from the meters of ash or volcanic mud that froze them in time on the day of the disaster. One of the many striking aspects of both locations is that as you wander through the site of an ancient disaster you are surrounded by busy suburbs, roads and shopping centres as, just as they did in 79 A.D., people go about their everyday lives in the shadow of the volcano. 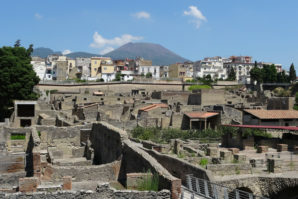 From Herculaneum, you stand in the streets unearthed from the 50ft of volcanic pyroclastic flow that submerged it you look up over the modern homes of Ercolano at the volcano (pictured). However for a true perspective of the landscape we climbed to the top of Vesuvius. As we walked around the rim of the volcano peering over the edge, watching the smoke rise, as the array of sensors tracked its every sigh, the guide explained cheerily that 3 million people could be effected by the next expected eruption. She continued to tell us that the risk is very real as Mount Vesuvius is very much active and the question is not if, but when, it will erupt again. For the 600,000 who currently live in the ‘red zone’ this means that they would need to be evacuated immediately when the volcanoes sighs suddenly turn to roars. From our vantage point on the volcano rim we could see Pompeii in the distance, flanked by the new town of Pompei, the lack of an ‘I’ differentiating it from its ancient tragic name sake. As I looked down on the urban sprawl creeping up the sides of Vesuvius, it occurred to me, would I build my home or business in the shadow of a volcano? The guide shed some light on the why people had decided that it was worth the risk, simply, land is substantially cheaper on the side of the volcano than anywhere else on this beautiful coast. The link between a volcano and dieting struck me, several hours later as I sampled a Margherita pizza, (they did originate in this region so it seemed like the obvious choice), it’s all about risk. Or more accurately perception of risk. How we perceive risk is a complicated balancing act between fact and feeling with our ‘feelings’ often trumping fact and logic. The fact is that Vesuvius will one day erupt with devastating effect in much the same way as one of my arteries will if I eat Margherita pizza every day. However, right now in the sunshine I feel safe, and as I admire the view of the volcano and culinary genius who in 1889 in honour of Queen Margherita (so the waiter tells me) invented the Margherita pizza, the risk of either an eruption, or a coronary, seems comfortingly remote and so I ignore both risks and get on with my life and my pizza. Our head in the sand approach to risk is an understandable strategy as it enables us to function in a dangerous world. If we were consciously aware of every risk that we take, we would be overcome by the knowledge of how vulnerable we really are, so generally we hope for the best and carry on. We have never had so much risk spelt out to us. Not a day passes when I’m not informed of the dangers of sugar, salt, fat, lack of exercise, stress plus the vulnerabilities lurking in my DNA, the risk of driving, global warming, pollution, crime and social media. If I ate my pizza as I drove home , too fast, because I was late, whilst using my phone to check Facebook I’d have pretty much nailed every one on that list in one go (not advocating that by the way!). One of the topics we cover in our ILM level 7 programme (launching January 2017) is how to accurately gauge the level of risk is and make decisions based on actual, rather than perceived or indeed ignored risk. We can’t tell you whether living on a volcano because it’s cheaper is a sensible decision or whether one more slice of pizza is a good idea but, we can give you the strategies that will enable you to make, informed, conscious choices when you choose to. I’m home again now, trying to counter my Margherita intake with salads and reflecting that right now, on a rather grey Cardiff afternoon as I look at our holiday snaps, all the risks of our holiday were worth it. That’s the thing with risk we don’t really pay attention to it until it’s too late, or never if everything turns out ok. For those living in the shadow of Vesuvius they are counting on this risk becoming reality so far in the future that they are not affected, in the meantime they can visit Pompei Bingo as they are obviously feeling lucky.